So I tried it out… and it worked. When one side conversation morphed into half of the class talking while I was teaching, I lowered the volume of my voice. One by one, conversations stopped and student necks craned to hear me. The hum of the conversations softened until there was silence. 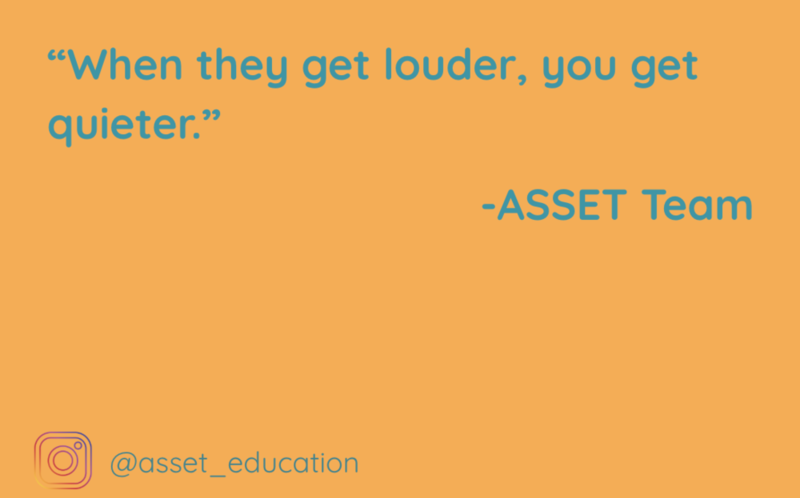 I always remember this quote (and channel my inner yoga instructor) when I lead an ASSET tool. I let my speech set the pace. I speak slowly, softly, and deliberately to create a peaceful and intentional classroom climate. ASSET time feels different than regular class time for a number of reasons (I turn off the lights, my students can get into any posture that feels comfortable), but my encouraging and soothing voice is one of the biggest reasons why students feel comfortable enough to try out different tools.